Applied seal 19th century American bottles are not all that common. Add a label and a ground stopper to the list of features and one comes up with a very short list of possibilities. 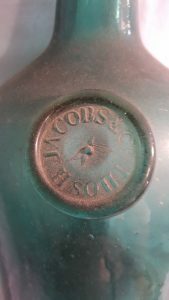 Recently closed on ebay was an auction for a 12-1/2″ tall blue-green demijohn bottle bearing an applied seal marked “THOS. 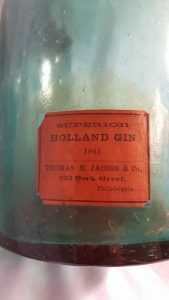 H. JACOBS & CO.” The bottle also retained what appears to be its original label, black print on a red background from the same company. Collectors are no doubt grateful to Mr. Jacobs for including the date 1844 on that label, allowing us to accurately date the bottle. Adding even greater amazement to the bottle is the intact ground stopper. The seller described the bottle as having a body of 5 inches in diameter. 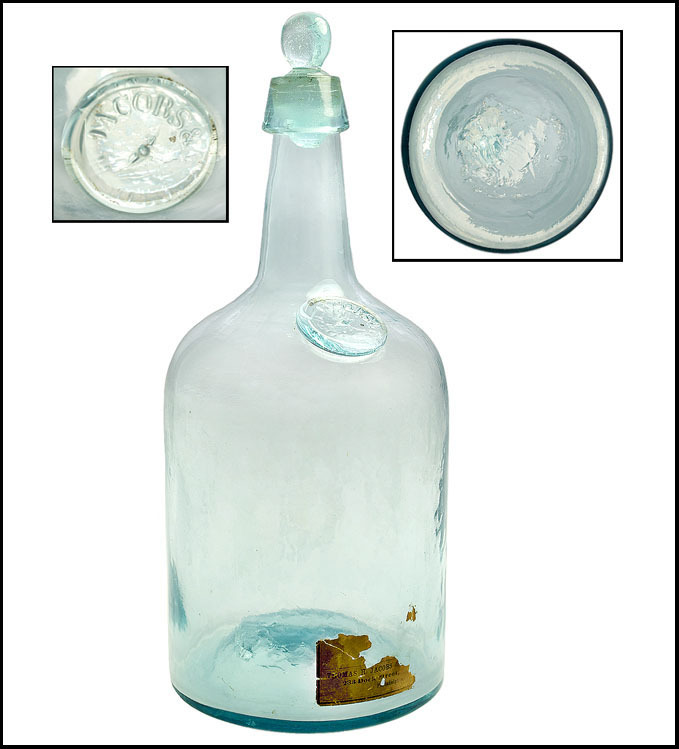 One photo shows a large pontil scar on the base, consistent with glass blowing techniques used in the age displayed on the label. The bottle sold for $2425. Thomas Jacob label for 1844 Holland Gin. 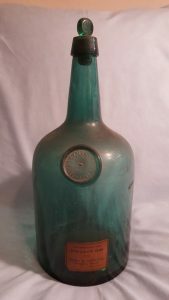 Also at auction this week at Glassworks Auctions is a nearly identical Jacobs bottle except it is in aqua. Same ground stopper. Same pontil scarred base. The catalog describes the seal as “THOMAS JACOBS & CO.” (without the middle H). It is hard to see the exact seal marking on the single photo posted on the auction but it seems the middle initial H. may be present in the picture. The embossing on the seal may in fact be the same but is mis-cataloged. Glassworks describes the height as 11-1/2″. Once again we see a similar label with similar markings. Note the different address here which is 233 Dock Street. At the time of this writing, no bid had been placed on this lot. The opening bid is $200. The Glassworks sale closes January 30th at 10PM Eastern Time.